The recent snow has receded and on Sunday the winds blew strong after Saturday's heavy rain. It felt more like March than mid-January. In the garden there are a few standing grasses, the ever present evergreen shrubs and trees and there are a multitude of seed heads. The variety of seed heads in the garden is quite amazing. From the stiff and prickly coneflowers all the way to this gnarly seed head from the Sinocalycanthus chinensis or Chinese Wax Shrub. There is a world of shapes and sizes well in between these two dried garden offerings. 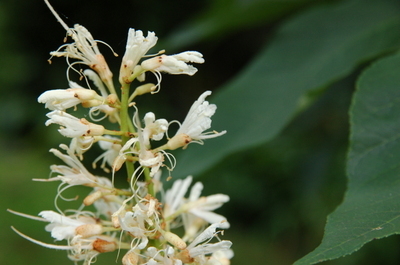 The Chinese wax shrub is relatively new to North America. I bought my plant from a local wholesale grower in CT and according to their information it has only been in cultivation since 1980. The nursery first received a plant from the Brooklyn Botanic Garden and they have been propagating and selling it since. Chinese wax shrub is a lovely shrub with shiny green leaves and delicately pink flowers. There really are not tons of flowers on this shrub but it is showy with its elegant leaves. The flowers are just a bonus. They are fairly large. Two to three inches in diameter and they do look quite waxy giving credibility to the common name. I will enjoy the memory of them until they next appear. Small gardening chores can be done here when the weather permits. I have gotten rid of that pile of leaves on the left side of the top picture. There are more to rake if time and weather allows although everything was quite muddy on Sunday. It sounded like winter but felt like the winds of March. Winter is not even a month old but winter gets old very quickly. It is over two months until actual spring arrives. There are lots of catalogs to read and orders for seeds must be placed. The chores of summer and fall are a distant memory along with the muscle aches those chores generate and the feeling that there is never enough time in the day to get them all done. Now, I am itching to get back into the garden. I will have to settle for a visit to a greenhouse full of lush plants and heavy, moist air. Any suggestions? I really don't like the word 'Buckeye'. I don't know why it just seems to stick on the tongue! 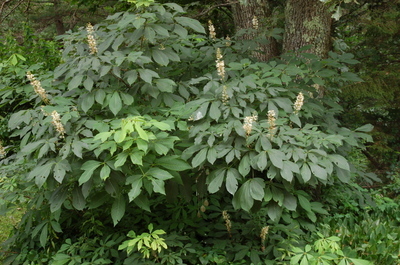 I do, however, love the Bottlebrush Buckeye or Aesculus parviflora. Are any of you growing this shrub? It is hardy from zone 5 through 8, at least, with some sources listing it from zones 4-9. That is a pretty wide range. I have had this plant in the garden for fifteen years or so. It is a very forgiving shrub tolerant of average garden soil and it has few pest problems although something did chew a bit on these leaves. 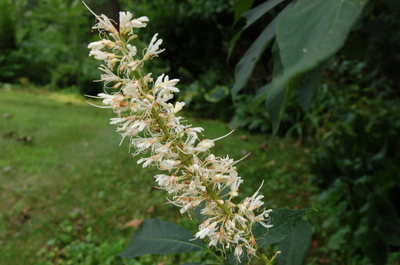 It prefers partial shade to shade and is native to the Southeastern United States! I guess that makes it a native plant although if it's not growing within a hundred mile radius of my yard I have trouble feeling that it is a legitimate 'native' plant, to me, anyway. There goes a big debate on native! This is a shrub which takes a bit of time to develop its' truly unique spreading habit. Mine is planted under an oak tree, which is definitely native, and it gets quite a bit of shade in this location. Michael Dirr , in his book the Manuel of Woody Landscape Plants, says, "This is an excellent plant for massing, clumping or placing in shrub borders". His book is my bible and his word rarely fails or disappoints. The shrub languished without moving much in the first five or six years of its' life. I then decided that I needed to prune it a bit to force it to spread. The year after pruning, it sent out suckers which emerged a couple of feet from the main stem so I continued this practice of pruning it just a bit in the spring and it continues to reach out a bit further each year. It has a rather coarse winter texture but that is a plus! The snow catches on the stems and it is so much more interesting to see the stiff branches coated with snow than just the trunk of an oak tree. Winter needs its' own special little tricks to create interest in the garden. I know that mine could have a few more flowers (note to self...add some organic fertilizer and a layer of compost next spring) but, I am happy that it is flowering and it is in a fair amount of shade. A bit more sun might also help to promote more flowers. What is more elegant that white flowers? I love the spread and breadth of this plant. It is about eight feet tall and fifteen feet wide which is what is listed as its' optimum height. The palmate leaves are an attractive dark green. 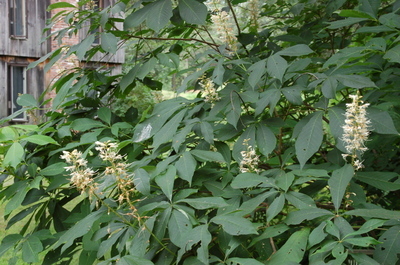 Most visitors to the garden do comment on this shrub even when it is not in bloom so there is an unusual appearance to its' form and foliage. It doesn't scream 'Look at Me' but subtly sits there with a bit of quiet majesty. I hope some of you are growing it and can share your observations!